In April 1969, thirty-one talented women signed a charter with Sweet Adelines International, creating the first (and only) women’s barbershop chorus in Westchester county. The chorus was called Shoreline, changing the name to Golden Apple Chorus in 1986. 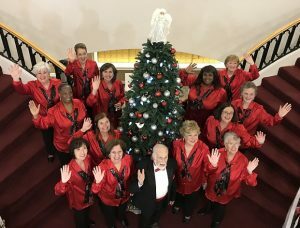 For the last 50 years, the Golden Apple Chorus has entertained audiences around Westchester and beyond, including women’s clubs, senior residences, nursing homes, street fairs, holiday parties, churches, and more! The Chorus also participates in annual competitions, winning several first place awards for best small chorus. Celebration of the 50th anniversary began with an anniversary show in December, featuring songs and costumes from the rich history of the chorus. The anniversary will culminate with a celebration dinner on Tuesday, April 23, 2019, at the Pleasantville Country Club in Pleasantville. Former members and directors will join current chorus members to share music, harmony and friendship. 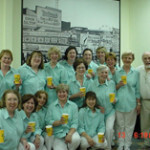 The Golden Apple Chorus is a women’s barbershop chorus, performing songs in 4-part a capella harmony, under the direction of Dr. Anastasio Rossi. For more information, please contact [email protected], or visit our website at goldenapplechorus.com. This entry was posted in Press Releases and tagged GAC Celebrates 50 Years. Bookmark the permalink.